I've been feeling the juxtaposition of being a grown up and being, well, not acutely the last week and a half. On the one hand, I'm unemployed and I have an extreme amount of guilt for not being able to help to contribute to the bills. We're fine financially, and Inspector Climate is always supportive, but it doesn't make me feel any less of a team player. The other hand of course is that I've been sick and literally have not left the house in 9 days. NINE DAYS. I've watched countless bad movies (some of them...twice), and have been coughing so hard and so frequently that I actually think I've perfected my smoker's cough. Which is impressive because I have never touched a cigarette. When I saw this link up last week I had to participate. Because when I grow up...there will be many things that won't be as they aren't now. First and foremost, I'm going to make sure we have a kitchen that's big. (Hah! I bet you thought I was going to say a job...foolish). Kitchens are where the home is (Kitchen is where the home is? Maybe, when I'm a grown up I'll learn how to speak English!). I want a kitchen that is colourful and has ample counter space. I want a kitchen with room for a table so that when we have guests over they can sit and talk while we cook. I want a kitchen with a gas stove. I want a kitchen that is so inviting that when I invite you over for tea we can't help but stay and make some scones too. Growing up is having a kitchen that sustains me. Where I'm not "making do" with odd tools for jobs, where I'm not getting angry at Inspector Climate because Dear Moses, must he ALWAYS be in my way? What do you think? What's growing up to you? Hahahaa..that last paragraph. I know that feeling. Beautiful kitchens! I think growing up is reaching a point where you know your heart and what you want. You become more centered in life. But I also think that life is a marathon rather than a sprint...and too often we treat it as a sprint. I'm so sorry you're sick! I had 9-10 days of a nasty virus after returning from London a couple of weeks ago and did nothing productive the entire time. Feel better soon! I'll be thirty in September and I still don't feel like a grown up. When on earth does that change? I want a grown up kitchen so bad, but then I remember that I don't really cook. They look so pretty though! is a must for grown-ups! but I grew up and need to.... and a great kitchen is a lot of help. Nine days?! You poor thing! When I saw this link up I never would have thought about kitchens! I LOVE that you linked them! PS...I did not comment on your last post when you mentioned you were sick. I meant to. You have been in my thoughts, though. I hope you are 100% better! i love all these pics. and a gas stove is the best; we bought one when we moved and it's way better than an electric one! I'm pretty sure all my "when I grow up" ambitions changed upon seeing these kitchens...stunning! I love the color, especially in that last one! Hope you get feeling better soon!!! I love the idea of your kitchen - and the idea of wondering about being grown up. I am not sure if/when I'll ever feel like I've made it... maybe if I had a kid, and was therefore responsible for sustaining another human life? In the meantime, I'll just live with being a really old teenager, hahaha! I can relate with the guilt, everyday. You put a big smile on my face when I saw your dreamy kitchens. Your post made me think about my idea growing up. I'll spend this weekend thinking about it. 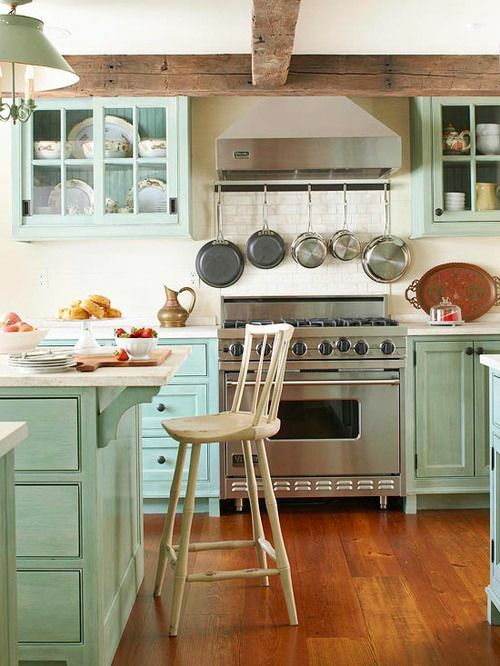 I have to say, some of those kitchens make me swoon! Also, I hope you're feeling better soon. That hacking business is not right. Although, you do get a workout while being miserable. So here's to you . . . cougher's abs . . . and a week filled with the best life has to offer! Those kitchens...so so lovely. Such a far cry from my tiny, useless apartment kitchen. I can't wait for a grown-up one! I want a big kitchen too, with a really nice oven and an ice machine in the fridge! Defo a breakfast bar or something! I'm moving house in July - going from a kitchen that has a big wooden table in it, to a kitchen that will not fit a table! I used to feel guilty when I was between jobs, but I got over it ;) It's awesome you have such a great hubby. some day the role may be reversed - that's part of being married, so don't be too hard on yourself. The kitchen do be the heart of the house. (heehee) If my entire house was nothing but a kitchen, I would be just dandy with that. - Being half crazy I could probably get away with it. When I win the lottery I'll buy you a kitchen home. I would sooo agree. I've been making do with apartment kitchens since I got here and I'm sick of it. Especially the little hotplate type cooking tops. If the house deal goes through I'll have a real kitchen...sigh! The kitchen! Yes, I agree. I want an amazing kitchen that is the center of my home and my family. You sound just like my family with all the sickness. Hope you get to feeling better soon. Growing up, we had one large room that included the kitchen, dining room and living rooms in one. The kitchen had a bar that was 12ft long. It was the place to be in our house. I'm with you on that one....definitely want a big kitchen too! I think I want all of this kitchens, too! And I don't even cook! Even though I hate working in the kitchen, I still love the idea of a big, open kitchen.. Probably since eating is probably my favorite thing to do, haha! I dream of the day when I can have a big kitchen too! We have some mock-ups of our dream home, and all of them feature an outstanding kitchen with a massive island.